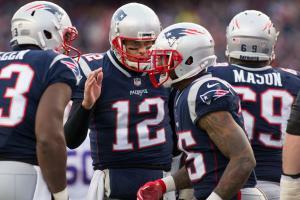 Jan. 20 (UPI) — Superstar quarterback Tom Brady is ready for Sunday’s AFC Championship. He posted a hype video to prove that point. The New England Patriots’ gunslinger posted a one-minute clip on social media Saturday. The video is narrated by Denzel Washington and features highlights from Brady’s career and from last year’s Super Bowl victory against the Atlanta Falcons. The Washington sound bites were pulled from a graduation speech he did in 2011 at the University of Pennsylvania. Brady’s clip has more than 650,000 views and 230,000 likes on Instagram, including one from Washington Nationals star Bryce Harper. The McCourty twins – Jason McCourty and Devin McCourty – commented with a series of goat emojis, referencing Brady as the greatest of all time. Devin has won two Super Bowls with Brady. Brady is listed as questionable for the AFC title game due to a right hand injury. The Patriots and Jacksonville Jaguars kickoff at 3:05 p.m. Sunday at Gillette Stadium in Foxborough, Mass.